It’s been an emotional few weeks for former NHL superstars Teemu Selanne and Paul Kariya, as the two were fittingly inducted into the Hall of fame together last Monday. Both played an integral part in building hockey in the city of Anaheim, and grew a close friendship over their playing careers. In honour of their recent inductions, the franchise they spent so many seasons together with decided to warm-up in their old jerseys ahead of their Sunday night home showdown against the Florida Panthers. Some skaters rocked the same jersey Selanne won the 2007 Stanley Cup in, while others wore the team’s classic old Mighty Ducks sweater with Kariya’s name on the back. Seeing those old school Kariya jerseys likely gave some of our readers goosebumps. Truly one of the best jerseys ever designed. Selanne currently leads the organizations in points with 988 while Kariya finished with 669 before joining the Colorado Avalanche. Their names were often seen beside each other on the stat sheets, and both reflected on their playing days together during their respective HHOF speeches. 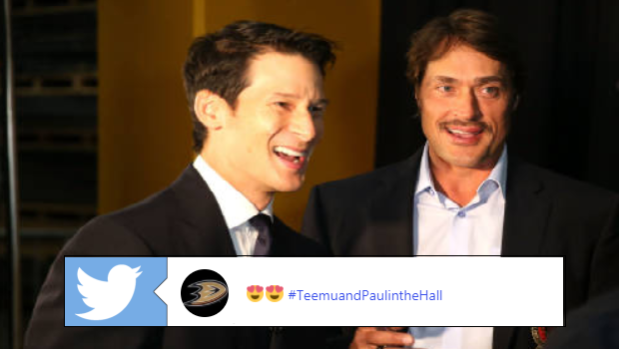 Teemu #Selanne and Paul #Kariya made sure to reserve special parts of their HOF speeches for each other. It was a classy move by the Ducks, and a fitting one when you consider their impact on the franchise. Kariya has stayed away from hockey since his retirement, so it was nice to see him involved with the game and organization he thrived in for so many years with.